Rahim Hasnani is co-founder of Agilosoft, a software development house based in Karachi. He has over 23 years of experience in the software industry. He has a bachelor’s degree in computing and master’s degrees in business administration as well as in computing. Rahim teaches as adjunct faculty member at FAST-NU and SZABIST and advises graduate students in their independent research studies. He is a Microsoft Certified Professional with certifications in SQL Server and .NET framework. He is also a member of IEEE and ACM. In addition to his experience in IT, Rahim has practiced mediation & conciliation at community level and now trains people on medication & conciliation. He is part of panel of trainers with Pakistan Mediation Association. 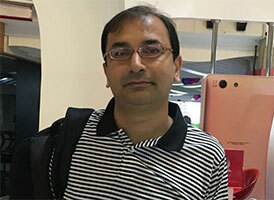 Mr. Hasnani is contributing author of ‘Large Software Projects – Risking Life and Limb’ (available at www.largesoftwareprojects.com) and his interests include reading and more recently, learning through online courses. At GetProfessional, Rahim looks after management of training programs and technical training.